If you’re a Star Wars fan, you may have had a long desire to ask someone this question. You may be wondering, what this has to do with Mind Bending Language?!? 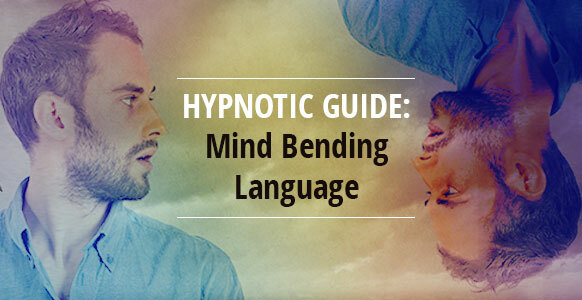 In short, Mind Bending Language is a little like the jedi mind trick of hypnosis. 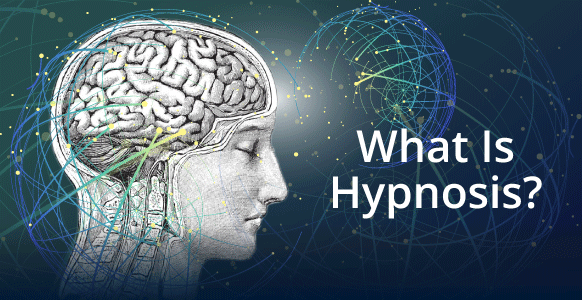 For the hypnotist, it’s a smooth, fast and elegant technique – and allows you to eradicate a subject’s preconceptions and problems very quickly. 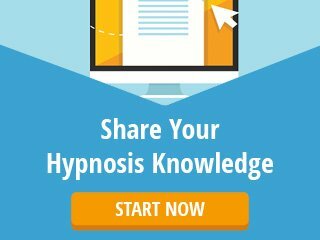 Dare we say, it’s one of the “sexier” hypnosis techniques because of the intrigue it stirs, and given its effectiveness – has a way of making hypnotists fall instantly in love with it. So what makes it so impressive? The main reason is due to its nonlinearity. Or otherwise put, its unpredictability and unexpected nature. So when you use it, no one can predict what you’ll say or do next. Another reason is because of its sheer speed – it’s like a magic bullet. Which is where the beauty of Mind Bending Language really lies, and what makes it really fun to use. Because of its unpredictability and speed, it has a way of surprising, even confusing, subjects. In a way, it jolts them out of one reality and into another where they see things in a new perspective – really quickly. However, it’s important to note that while confusion does open your subject’s mind up to new ideas – confusion is not the main purpose behind Mind Bending Language. It’s more of a temporary, but very a beneficial, side effect of opening the mind to new possibilities. What Is Mind Bending Language Used For? 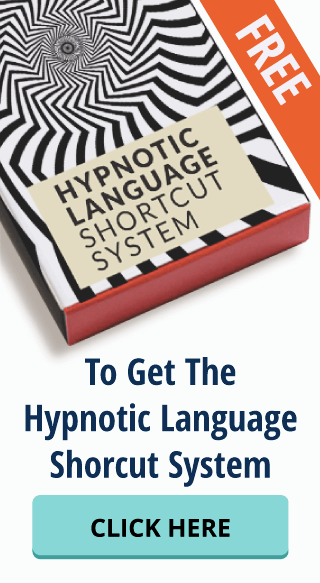 Mind Bending Language can be used for anything that hypnosis is used for. But where its greatest strength lies is how it effective it is at breaking down rigid mindsets. The kind of mindsets that are stuck on a constant loop, worn-out by repetition and limited by their perspective. This is because of how fast and unpredictable Mind Bending Language is. It has a way of cutting through and shattering mindsets “stuck” on a negative or limiting loop. Often when you try to get people out of these kinds of mental loop patterns using a linear process – a logical step-by-step process – it doesn’t work. This is because subjects can’t see beyond their constraints, no matter how logical your approach may be. But what Mind Bending Language does is cut right through their problems. Much like smashing a vase or a piggy bank to get the dollar out, instead of trying to squeeze your fingers uncomfortably through it. Mind Bending Language adopts the same fast, swift process to get to the root of the problem as a result of bypassing the obvious constraints. And this is exactly why things can initially feel really confusing for the subject. Because you’re smashing one reality – a world that they know – and placing them in a new reality, one where the “problem” filters are removed and they can see new possibilities. For example, imagine someone who was born blind, but through some miracle, they can now see. Chances are, they would be very confused at first by the sights and sounds around them as they didn’t have the benefit of learning how to map these from birth. Images would most likely be difficult for the brain to interpret, because it lacks the proper context. It takes time for the brain to map and develop these responses. For example, this same person may experience trouble telling the difference between a real apple and a picture of an apple from a photo. This is because they haven’t learned the mechanisms that help them tell the difference between an illusion and reality. And this is what happens on a mind bending journey – which is why it can be little confusing at first. Going beyond the realms of reality with Mind Bending Language. Image Credit: This GIF was created by artist Florian de Looij. On a mind bending journey, people might go to places or have experiences outside of the normal realm of reality, out of the boundaries of their minds. 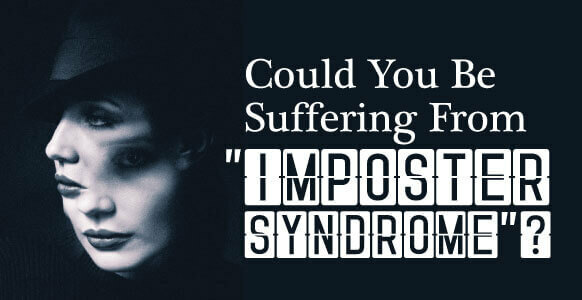 But as a result, subjects naturally get unstuck very quickly as it takes them to a trance of infinite possibilities. It “pops” subjects out of habitual ways of thinking and negative trances – as it gives them fresh eyes and new possibilities. In many ways, Mind Bending Language is kind of like exotic travel. It gets your subject’s out of their comfort zone and transports them to a different mental landscape which can almost feel surreal. Which is a big part of its appeal. It’s not too dissimilar in the initial sensation obsessive movers get when they relocate somewhere new. Or those who are constantly redecorating. They crave the sensation of their environment being new and fresh. It gives them renewed hope and is a means to escape from their problems. And to begin with, each relocation does have this effect. But after a while, they are reminded of all the things that they don’t want to be, or the problems they have in their lives. So at an unconscious level, their way of escaping or dealing with the issue is by moving, changing or re-inventing themselves again. In a way, they are seeking a mind bending journey. To go from one reality to another, however, the difference with obsessive movers is, the move doesn’t solve the problem if they have entered it with the same, worn-out mindset. The same issues will keep resurfacing, which is what prompts their desire to relocate again. And again. And then again. But with Mind Bending Language, it isn’t a return journey. The old mindset or need to escape doesn’t resurface after the initial buzz has worn off, because it’s been replaced by a different perspective. As a result of seeing things differently, the mind has learned something new. The old viewpoint has become outdated and no longer makes sense to focus on. It’s a bit like finally mastering your favorite recipe. Now that you know which ingredient makes all the difference, you wouldn’t go back to the way you used to make it, would you? It wouldn’t make sense to spoil such a flavorsome dish with a substandard ingredient that brings you less enjoyment. The same is true for the mindset shift that happens as a result of Mind Bending Language. However, the purpose of Mind Bending Language isn’t to confuse someone – this is just a useful side effect. The purpose is to alter a subject’s mindset by opening their eyes to new, fresh possibilities. Mind Bending Language evolved from a technique known as Beyond Words (now called Attention Shifting Coaching) by a family therapist by the name of John Overdurf. 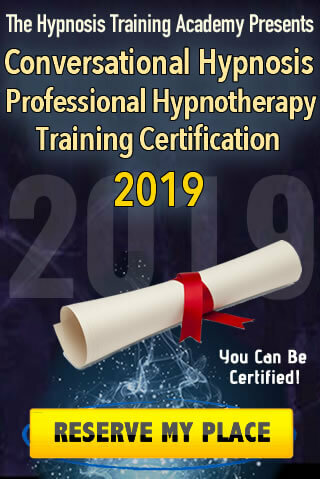 What initially lead Overdurf down the path of creating this technique was actually his struggle to get his clients to do his assignments – prompting him to learn Ericksonian Hypnosis and NLP. This was before NLP had really taken off, so its core method at this stage was something called the Meta Model. But what made him such a genius in our eyes is how he studied and combined so many different styles of question based therapies – everything from Socratic questioning methods, Zen Buddhist Koans, ancient Sufi Tales, Ericksonian language, NLP and the Meta Model – to come up with the game-changing Attention Shifting Coaching. Why is this so important? Aside from the technique itself being highly effective, it then lead to the creation of Mind Bending Language. But First, What’s The Meta Model? The Meta Model is a questioning technique that questions people’s reality. It penetrates beyond the surface level of people’s communication to reveal what they’re really meaning. With “Meta” meaning beyond something, its name implies that it goes beyond the surface level to a deeper level where a different meaning is revealed – like a metaphor. Its philosophy is also based off Polish scholar, Alfred Korzybski’s, study in general semantics. Korzybski argued that our knowledge of the world is limited by our nervous system and the languages that we have developed. That the surface structure of language doesn’t always reveal the true meaning of what’s being said. It’s the deeper level that often reveals the true meaning. It’s a question about your capabilities. But the deeper structure of that question is really to request that you close the door for them. And the reason for phrasing it as a question is because it implies respect. This type of response poses a challenge and takes them back to the place that they don’t want to go. So in a way, the Meta Model is mildly mind bending because of how it uses a nonlinear questioning technique to get people to look at their problems in a way that reveals the bigger idea behind the surface level. Then in the ‘80s as the next wave of NLP-ers continued to experiment with the Meta Model, they discovered what was known as the “Holy Grail of NLP” – Bullet Therapy. A question that’s so perfectly loaded with Ericksonian language and the Meta Model style of questioning that it would force the person to stop experiencing their problem? And while some success did come out of this style of questioning, it had its limitations so the model continued to evolve until it transitioned into Meta Model 3. So instead of trying to pack all of the presumptions into some magic or “bullet” question, Meta Model 3 worked off the theory that you had to take people through a journey. That you needed to ask a series of loaded questions that would lead towards an outcome. For example, it initially would start with the problem and the assumption that you’ve had the problem for some time. So by getting you to think about your problem being in the past, unconsciously this suggests that you leave the problem in the past. This entire process allows someone to examine why they may be stuck and gets them to take full responsibility for their problem. Simply asking someone how they can overcome the problem, helps change their way of thinking. This, in turn, creates a kind of flip, first establishing the problem then destabilizing it. All of this is designed to help them create their own unique solutions. It was at this stage, Meta Model 3, that Overdurf entered the picture. As a result of combining these teachings with his own passion for spiritual philosophies to exploit the ambiguity of language, he developed what later became known as Attention Shifting Coaching. Then some years later, this then lead to the evolution of Mind Bending Language after Igor Ledochowski was mentored by Overdurf. So it’s really a combination of the above techniques – in addition to some dating as far back as Socratic questioning methods – that have lead to the creation of Mind Bending Language. Or in other words, your language encodes every advance your ancestors made because it’s the way you communicate with, and interpret, your world. But, your language is also your prison. In turn, you have all of the limitations your ancestors had. When the language of your culture limits you, you succeed like every other member of your culture. But you are also blinded like every other member of your culture, unless you decide to push beyond these limitations. But the good news is: if language itself created the problem, it can then be used to solve it. 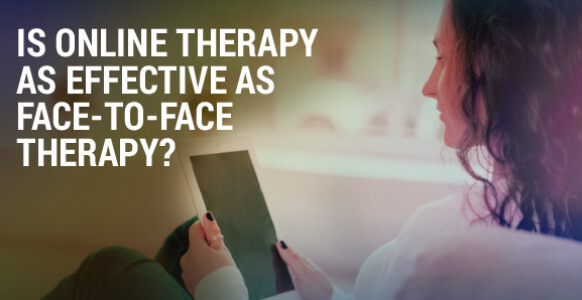 IMPORTANT NOTE: When it comes to hypnosis and NLP, these niche fields haven’t received as much scientific research and attention as other therapy styles, such as Cognitive Behavioral Therapy. Therefore, while a lot of the research has been carried out, it’s been done so empirically. So below is what we think happens from a neurological standpoint when Mind Bending Language occurs. The main reason Mind Bending Language is considered to be so effective is because of how it allows you to do something called the Amygdala Hijack. The amygdala is an almond-shaped mass of grey matter inside the limbic system, which is involved with the experiencing of emotions. 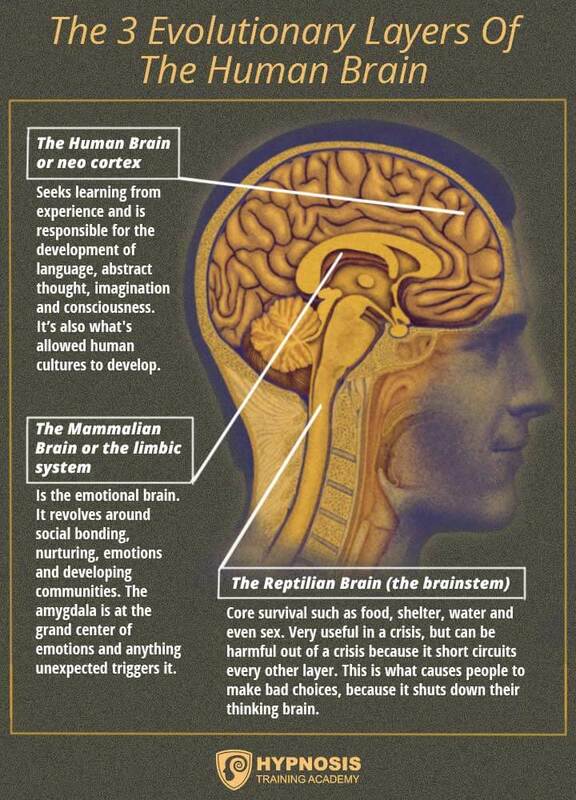 To understand why this is important, let’s take a quick trip back to human biology class to see the 3 evolutionary layers of the brain – the reptilian brain, the mammalian (or limbic) brain and human brain (the neo-cortex). So what kind of things trigger the grand central station of the mammalian brain – the amygdala? One positive thing that triggers the amygdala is humor. This is because when you laugh, you initially go into some form of shock, which is a hijack. After that, you can have a big laugh and enjoy yourself. Aside from feeling incredibly pleasant, laughing opens up new pathways and new learnings – just like Mind Bending Language does. And the other benefit is that humor also hijacks negative emotions. But on the flipside of the coin, bad news also triggers the amygdala threatening your well-being and triggering fear, panic and anger. 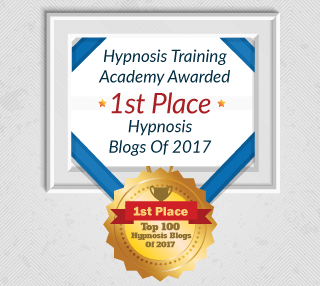 So why is this important to you, the hypnotist? Because positively hijacking the amygdala in a very specific context allows you to collapse or reset someone’s stubborn thought patterns. The key to all influence is being able to transfer a thought into actual thinking, triggering the amygdala. The amygdala talks between your reptilian brain, the prefrontal cortex and neocortex. It helps you access that part of the brain that helps you plan, think ahead and have all the wonderful traits a human being has. Mind Bending Language causes a breakthrough moment catching you by surprise – which in turn triggers the amygdala. This then basically stops the problem or those repeated thoughts creating the problem. And in turn reorients the mind to seek new resources. Tony Robbins uses the idea of pattern interrupts to achieve a similar way of eliciting surprise in subjects. One of our favorite examples of him doing this is when he was working with a woman who was experiencing great difficulty finding a meaningful relationship. The woman then went on to mention how perfect her father was. In her glowing review of her late father, who died during her childhood, she shared how playful, loving, wonderful and kind he was. Obviously Robbins wasn’t unnecessarily attacking this woman’s late father. But he could see that she had been unfairly comparing every man she met to her late and “perfect” dad. With these rose-colored glasses on, it was obviously becoming impossible for her to find someone who measured up to her high standards. So by Robbins saying what he did, he hijacked the amygdala and got her to look at things from a different perspective. Well, initially they were called cupcakes. But after a poor week of sales, they pulled out their marketing hats and decided to call the cakes “half cakes” instead. And it worked. This new terminology threw people off. It was new, intriguing and what’s more, unlike a cupcake, a half cake wasn’t associated with large amounts of sugar…. yet. But it was exactly the same product – however, this unusual term managed to trigger the amygdala hijack and get people looking at it from a different perspective. The amygdala hijack isn’t actually the solution – it is the destabilization of the problem that allows the solution to come in. The amygdala hijack simply sets up a cascade of other events. It is the pattern interrupt that causes a reframe and a new way of breaking through old thought loops. This philosophical riddle is meant to provoke thought. There is no right answer because one hand cannot really clap. The Zen student is supposed to meditate on this riddle until he or she reaches some degree of insight or enlightenment. Now you may not reach a state of enlightenment by pondering this phrase, but it does get you thinking because the phrase presents a paradox. Mind Bending Language presents a paradox too, because with one simple question you can completely derail someone’s thoughts. 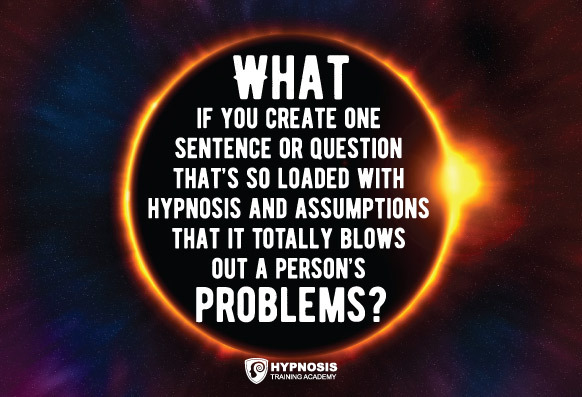 Mind Bending Language is a powerful tool used in hypnotherapy or conversational hypnosis that can help a subject get unstuck from a “problem” thought loop. This shift enables them to see new possibilities fast so they can let go of the problem and see things through a fresh perspective. It doesn’t rely on conscious intellect or understanding – so instead of arguing your way out of a problem – you are in a sense rebooting the problem using a state of mind as the leverage. And one of the techniques you use to do this is the PCAT Formula. 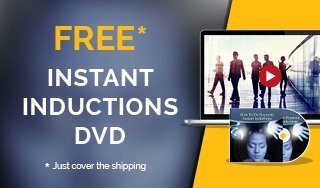 There are other techniques, such as the Contradiction Blowout which essentially is a more advanced version of the PCAT, but this formula allows you to get right to the heart of the problem – meaning you can help your subject quickly overcome whatever they’re stuck on. Mind Bending Language can be used throughout the PCAT Formula process whenever resistance is present, to open up possibilities and choices once more. What Does The PCAT Formula Stand For? In order to effectively change a problem, you have to first access the problem so that the brain’s neurology lights up. You do not, however, want to re-traumatize the person by bringing up too much emotional trauma. You just need enough of the problem active so that when you later access the resources, it has something to attach to so the problem can be transformed. The critical factor is like a guardian at the gate of our unconscious mind. 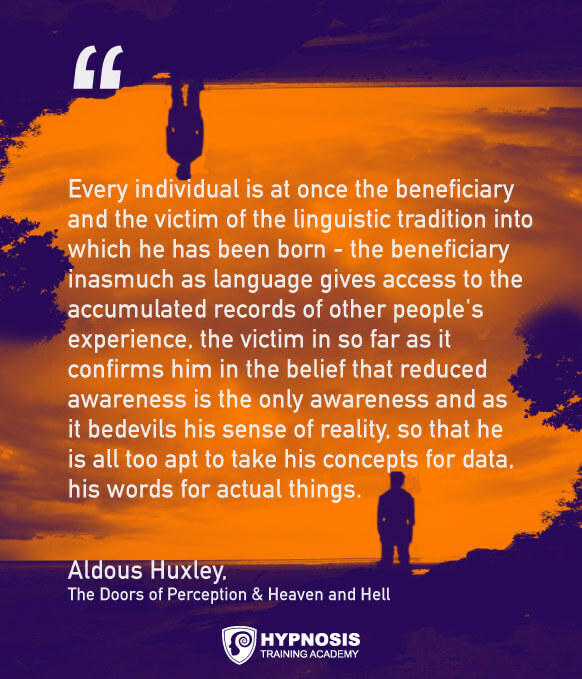 It’s part of our conscious mind that assesses and looks for data and criteria in what’s being said in order to satisfy the personality, in addition to all its beliefs and attitudes. Or create resistance if this criteria isn’t met and seems threatening to the status quo. There are many ways to bypass this critical factor, one of the fastest ways is through Mind Bending Language, where the change in context comes so fast the conscious mind can’t make heads or tails of the information. 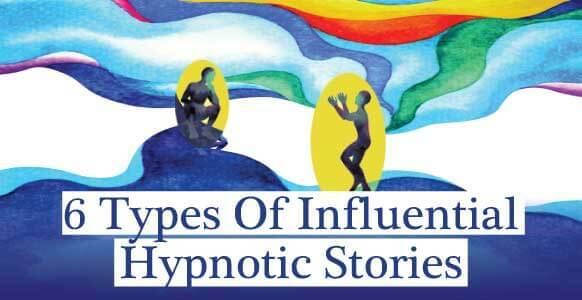 This then causes the unconscious mind to take over so it can interpret it. We all have tremendous resources that we’ve used all our lives in different situations. When a problem arises, the reason it gets stuck is that the thought loop doesn’t include the resources that would solve it. So once the critical factor is bypassed, all the resources of the unconscious mind are accessible once more. The hypnotherapist or coach will help the person recognise and access these resources and light up that neurology in the brain. While the resource state is fully activated, the emotions are present and the neurology in the brain is lit up, you now get the person to think of the presenting problem. The resource state links its neurology to the problem neurology and the problem cannot maintain itself now in the face of having the resources to solve it. The problem thought loop has been interrupted and transformed at the unconscious level, causing lasting change. As you can see, this jedi mind trick is really much more than a just trick, because Mind Bending Language really works.